Brainy's Share Market Toolbox - a collection of tools to help you tackle the market. or learn about the investment strategies of others. some of them go to the Toolbox Members' Area (MA*) pages - those links are shaded blue. Nimble short term investing - just one possible approach. Successful Investor's Mindset - We can optimise our successes by adopting a particular mindset. Sharemarket Success Secrets - Some high level and fundamental tips to help achieve success with our investing. Some great questions to ask your share broker or financial advisor. What about other financial instruments (eg. hybrids, options, forex, CFDs, etc.)? See more details here. And you want to monitor their performance and the broader stock market? And you want to do it quickly and easily? No problem. The links on the Portal page are useful for tracking and monitoring company performance, share prices, market progress and finance news. Or you might be interested in charting software. Blue chip stocks can disappoint. Intrinsic value and value investing - forget it. IPOs can be a waste of time. The Santa Rally was invented. Interesting questions for your advisor or broker. Shares, indexes and the share market? For those readers who are not sure about the terminology, here is a brief explanation before continuing with the juicy material below. shares - The capital of a company can be divided into shares, where each share forms a unit of ownership, and is offered for sale in order to raise the required capital for the company. A company can be privately owned, or publicly owned. Where it is publicly owned, the shares of the company are listed and traded on a particular share market (or equity market). For more details see Wikipedia. equity market - Another term for share market. market index - This is a measure of the value of a particular section of a share market. In simple terms, the value of the shares of a specific group of companies are aggregated using a specific formula to arrive at a nominal value. trade - A trade is the buy/sell transaction where one or more shares in a company change hands for an agreed price. The volume of shares so traded might be as small as one share, or many many thousands of shares. Which stocks in each index? How much money? Which Stocks? Strategies? etc., etc. How much time to devote? Are you Share Market Ready? Sensible Investing - Ask yourself "Does that seem sensible?" Contrarian Investing Redefined - A modern definition for this age-old term. Funda-Technical Analysis - A clever blend of fundamental analysis to identify quality companies, and technical analysis to cleverly time the purchase (and sale) of shares to minimise losses and maximise profits and capital. You might be interested in Robert's Nimble Short Term Investing philosophy. The market is like an elephant - It can be very useful to remember this analogy. See information about the Successful Investor's Mindset. See the list of Share Market Success Secrets. Already investing? but having some problems with success? See Common Investing Problems. What about some Investing and Trading Tips? Can I invest my SMSF funds in the share market? It might be possible to invest SMSF funds in the share market, either for the long-term or maybe for short-term profits. It depends on a few things, including the SMSF documented investment strategy. See some key information here in the Toolbox. There is no strict definition of the term blue chip. Blue chip stocks are not all they are cracked up to be. Too many blue chip stocks fell significantly during the GFC, so any investor/trader who relied on good capital gains would have been disappointed. Even blue chip stocks can tumble, and stay stuck below recent highs for years. See lots of details and some real charts explaining all this about blue chip stocks. And what's the conclusion? It might be worth spending a little more time to find investable stocks further down the list of stocks. Australian market operators - Since late October 2011 there have been two major share market operators in Australia (ie. an organisation which offers a facility whereby the orderly exchange of company shares and derivatives can take place). There are also smaller specific-purpose market exchanges / operators. Chi-X Australia - The newer market exchange in Australia that opened in direct competition to the ASX operating since October 2011. National Stock Exchange of Australia (NSX) - An exchange specifically focused on small to medium enterprises. Asia Pacific Stock Exchange (APX) - An exchange that operates in the Asia-Pacific region providing opportunities for growth oriented companies to raise capital. For information on other markets, see details at world-stock-exchanges.net. The 2019 Trading Calendar - A list of the trading days/holidays in the current year, and early finishing times when appropriate. In addition to this, the Chi-X exchange now handles a large portion of trades in Australia. See the Chi-X Market Holidays notices. Time of day on key world stock markets - Brainy's web page showing a list. NYSE Holidays and Hours - Holidays and hours for the coming months. Group 1 - 10:00:00am +/- 15 seconds - all securities starting with a digit 0 to 9, or the letter A or B (eg. ANZ, BHP). Group 3 - 10:04:30am +/- 15 seconds - those starting with a letter from G to M (eg. GPT). Group 4 - 10:06:45am +/- 15 seconds - those starting with a letter from N to R (eg. QAN). Group 5 - 10:09:00am +/- 15 seconds - those starting with a letter from S to Z (eg. TLS). World holiday dates at investing.com. Web page portal listing lots of web pages for daily use to check on the market, and to help with research. Share Market GEMS (summary list) - A summary list of cliches and infamous share market tips (is 2 pages when printed). The Toolbox Members full version (MA*) includes more details and explanations for these share market GEMS. Lotsa Web Links (MA*) - A pdf file listing over 200 different and useful web sites on a whole range of investing and trading topics. Robert has more publications available. Some for free and others for just a very modest fee. Many are free to Toolbox Members. SPI Futures - Information about various ASX options contracts including the SPI (Share Price Index) futures contract, including the exercise timetable. ASX Indexes - Composition - How are all the ASX indexes, and sub-indexes, made up? More S&P information about the Australian Market Indices. At some stage, many investors think about investing in something other than shares. This could be a related financial instrument such as foreign currency (FX), commodities, bonds, warrants, options or futures contracts. The pros and cons of these are not discussed here. copper, lead, zinc, tin, aluminium, nickel, cobalt, molybdenum, etc. WTI oil, Brent Crude oil, natural gas, propane, etc. rice, soybeans, wheat, cotton, coffee, corn, cocoa, sugar, etc. Okay, so you think you want to take more control of your investments, and perhaps to mange your investments with a more hands-on approach. And maybe even trade shares yourself. It can seem scary; but it doesn't have to be. but it doesn't have to cost lots of money." How much money is available for investing (ie. the funds)? How much time do we need to devote? - See a discussion on the balance of time. Which asset classes do I want to spread the funds across? What is my risk tolerance? Can I tolerate a lot of investing risk, or not? See the FiRT (Financial Risk Tolerance) table in Brainy's eBook pdf number ST-2180 (see the Member version, or the page-1 preview). Which stocks to ignore and which to focus on? - That is, if you want to trade or invest in shares, then how do you decide which ones to focus on and which to ignore? See the discussion below on Your stocks universe. Do I want to take the sensible step of using Funda-Technical Analysis? Investing Plan and Strategy - Who can help prepare a sound plan and strategy? See some tips for getting started, and more details in some of Brainy's eBook (pdf) Articles. Professional advice - What about the appropriate professional advice to assist with planning and executing the strategy? Practise, practise and more practise - It can be very useful to gain some confidence and experience in a safe environment. Use paper-trading to test out a strategy, or use back-testing and trading simulation to test a strategy more vigorously. Are you Share Market Ready? Take a look at Robert's Share-Market-Ready checklist. and who seems to make sense (sensible investing)." Interested in share price charts, and how to read them? consider learning about Technical Analysis (ie. charting). Many people who start out learning about charting suffer from information overload. Many people find that over a 2 or 3 year period they find out various snippets of information about charting (Technical Analysis), and their focus is distracted. Investing in cyclical stocks? - One of the many strategies for selecting stocks for investment is to monitor the economic cycle, and the investment clock, and to select either cyclical or defensive stocks as appropriate. See a discussion on this approach. Good / bad news can move share prices - Many investors realise that a good news announcement can move share prices, as can a bad news announcement. And a good news announcement can cause a company's share price to fall if the good news is not as good as anticipated. Reporting / Earnings season can move stocks - The so-called reporting season (or earnings season) can produce news announcements which investors like, resulting in a share price re-rating upwards, or which investors don't like, resulting in a negative re-rating of the share price. Many investors watch the reporting season in America. Note that there is a key difference between the reporting season in Australia, compared to the USA, as explained in the following comparison. Half-year cycle - Most public companies report each 6 months. This means that companies will report either their interim results (or first half results), or their final results (full year results). Year-end - Most public companies have a financial reporting cycle with year-end at 30 June each year, but many have a year-end at 31 December. There are a few companies who have financial year end at different times again. Reporting period - These companies are required to report their latest 6-month finances within 60 days of the end of the period - end-August for most and end-February for many. Quarterly cycle - Most public companies are required to report quarterly - ie. every three months. Earnings season starts - Generally, each earnings season starts a week or two after the last month of the quarter. So, for example, for the December quarter (the three months of October, November, December), companies announce their earnings in January. Season end? - Most companies have generally announced their earnings results within six weeks of the start of the season. Alcoa (a large company and listed in the Dow Jones Industrial index) tends to kick off each reporting season (often in the second week of the month). This announcement is always anticipated and closely watched by analysts and commentators, and rightly or wrongly used as a barometer of the markets and economy. Author Strategies - It is a very good idea to record your "preferred" ideas and methods for "analysing" the market. Then they start to crystallise. One possibility is to find a "famous" trader / author - someone whose ideas you like and feel comfortable with. This includes the likes of: Alan Hull, Leon Wilson, Stuart McPhee, Louise Bedford, Jim Berg, Frank Watkins, Daryl Guppy, Stan Weinstein. These people are all Australian-based (except Stan W), and they have all published a number of text books on the subject. But, one downside in heading down the track of reading books is that in a couple of years time you will probably have a head full of even more ideas and will be no closer to your goal. Many people find they have a bookshelf full of books, that are only half read. Be comfortable with spotting up trends and down trends. Start with the Weekly Market Analysis page in the Public area of the Toolbox. It includes just a small number of indicators - MA, GMMA, Momentum, and Twiggs Money Flow (TMF).These are key indicators, and very common (TMF not so common). Follow the comments that are "on" the charts in the Weekly Analysis for Toolbox Members every week (to do this you do need to view every chart so you can read the comments on the charts). These are based on the items in point 2 above. It is like an ongoing tutorial to help you understand these key indicators. Why would I buy shares? This is a good question. Some people prefer to invest money in managed funds, or directly into property, or maybe share options or futures, or perhaps forex (foreign exchange, currencies). Many people keep it simple, and stick to Australian shares - something they can relate to, and which has some meaning for them. But before doing this we should ask ourselves why we are doing it, and have a sound plan. A type of investment plan and strategy is extremely important. There are a number of eBook pdf Articles on (Share Trading) strategies here. What type of analysis methods should we use? Fundamental analysis? Technical analysis? or what? This a choice that befuddles many investors and traders. See more information about fundamental analysis, technical analysis, and Funda-Technical Analysis. How to pick winning shares/investments? Stick with something you know. If you don't understand the product, then either learn more about it, or avoid it. Successful investors tend to have a specific mindset. Trends - If a stock's share price is trending upwards, then riding the trend can be useful. But if the price is trending downwards, then why but it? On the hope that it will stop trending down and turn up at some point? See Trends details below. For more GEMS like these, see Brainy's Share Market Gems. Take a look at Robert's Weekly Watch List - which he shares with Premium Toolbox Members. Classical Dow Theory states that if a stock is trending, then the trend is in place "until it is confirmed to have ended". There is a Wall Street adage - "the trend is your friend". Learn the characteristics of trends, and all about how to pick an up trend. If you can spot a trend, and ride the trend, it is possible to be profitable. But you need to keep a good stop-loss in place. See Brainy's "3Ways Rule" for details about trends. ** - More trend-spotting details here. The day-to-day and week-to-week performance of companies in the share market depends on the underlying mood and sentiment of all the investors and traders who participate in the market. When a company's share price rockets upward, or dives downward, it is because enough of the market participants have a strong enough view of the stock, or of the market generally, to cause the share price to move. That is, the emotions and opinions of market participants move the share prices, and these are summarised in the price charts. See more details about the emotion and psychology drivers of the share markets. Some people follow fundamental analysis, and buy shares in a company because they think they will go up in price. But is this sensible? Some people buy shares based on the price chart alone - if the price is trending up, then they ride the trend because "the trend is your friend". This is based on Technical Analysis (also known as charting). There is a long list of eBook pdf Articles on Technical Analysis. And some people go for a bit of both - we call it Funda-Technical Analysis. The first part of this strategy is all about choosing stocks from a list of quality companies. Stocks with a proven history of returning value on the shareholders equity, and which are not over-geared, and which are also likely to have improved earnings in the months ahead. More information in the eBook Article ST-2300 (MA*). If you have decided to trade or invest in shares, how do you decide which ones to focus on? This is important because of the 2000+ shares on the Australian market, many people decide not to buy many of them for one reason or another. It might be due to a lack of liquidity, or "old world" stocks, or micro-cap stocks. Whatever the reason, it is very useful to give this some thought. Read more on the "Your stock universe" web page. The two terms support and resistance basically refer to price levels on a price chart where the share price has paused in the past, and where it might be expected to pause again in the future. These features are simply a reflection of the views and opinions of market participants regarding the perceived value of the company's shares. The long-term buy-and-hold investor rarely contemplates selling an investment position. However, the astute investor/trader who wants to protect capital and capture profits carefully considers the possibilities for exit strategies, and ruthlessly implements the chosen strategies. The humble Stop Loss can help us enormously to limit any losses, and thereby protect our hard-earned capital. This includes the notion of an Initial Stop, and a Trailing Stop. But what is this thing, and how do we calculate a Stop Loss? If you are serious about protecting profits, and utilising techniques like a Stop Loss, then you need to be confident that when you decide to sell your stock there will be a buyer there to buy it. Some stocks trade only a few times each day, or worse still, a few times each week. This is not the sort of stock that we want to be holding. Learn more about stock liquidity, and what the consistently successful traders and investors do in this regard. See more details here. There are two opposing points of view about profits, and how to maximise them. Some people set a profit target which might be an arbitrary percentage amount above the current price - say 20%. By selling out here for a profit, it is possible to keep the profit, but potentially miss out on a much larger profit. Some people prefer to "let the profits run". By maintaining a sensible Stop Loss, and monitoring the position, it is generally safe (but not always) to let the profits run. It is very important to have a documented investing / trading plan, and one or more strategies. Exit strategies and Stop loss. Share "trader" or share "investor"? Are you a "share trader" or a "share investor"? This question often arises, and there is much published on this topic. The actual and precise distinction might get down to semantics such as your desire to "own a part of the company", as opposed to temporarily owning an item which you can soon sell for a profit. Many books with slightly differing views have been published. Technically, a share investor typically holds shares for a longer period of time, and pays capital gains tax on any profit (or claims a capital loss on losses). On the other hand, the share trader typically holds shares for the short term with no consideration of the impact of capital gains, and might be happy to pay income tax on the profits. However, the Australian Taxation Office is the body in Australia that will decide whether an individual is an "investor" or a "trader", and how any profits will be taxed (and how any losses might be dealt with). The defining criteria are not clear. See the Australian Taxation Office web site and more details with this Google search. These days, trading or investing online is all the go! But there are traps and pitfalls. Who can you trust? See the comments at right. Without proper preparation, the trading/investing journey can be a very short one. Many people embark on trading or investing with little preparation, on the understanding that it is easy, and that the profits will flow. But the truth is that it is not so easy. Proper planning and preparation includes a good Trading Plan, and a sound and tested Trading Strategy. Without this, you might as well be gambling. More information about plans and strategies is included in Robert's Articles. Also see the section above on getting started, and ask yourself if you are really Share Market Ready? Take a look at Robert's Share-Market-Ready checklist. While some operators are very trustworthy, there are some who are only concerned with emptying your wallet. Here are some good questions for your financial adviser or stock broker. But, beware of the sharks in the ocean! Robert periodically runs seminars and workshops to explain the share market and how it works. His Share Market Secrets seminar (aka Boot Camp) is a good starting place. Or his Blue Chip Price Chart Secrets seminar (aka Technical Analysis/charting introduction). Why does Robert run seminars and workshops for a living? A quick word about some of the other courses and seminars, especially the free ones. Some of these trainers are touting a specific product, or an expensive follow-up training course (without naming any). So take care. By all means go along to the free ones - nothing ventured nothing gained. Good Books - There are many books available. Here is a short starting list, and a plug for a good book shop. Robert's Share Market Gems and cliches - Robert has compiled a list of useful cliches and snippets of useful information about the share market. It has taken a few years to learn all this, but it is summarised here for you. How about a Sensible Approach to Sensible Investing? Now, is that a good idea? Have you seen a sensible approach lately? Are you ready for the next Bear Market? They come around faster and more often than we care to admit. Robert has prepared some notes entitled "Beware the Share Market Bears! - They are never far away". Also consider joining the Australian Technical Analysts Association (ATAA). 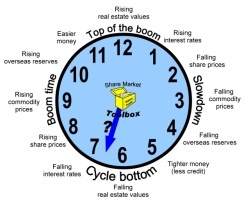 Share Market Toolbox - More information about Brainy's Share Market Toolbox - a great collection of useful articles, eBooks, charts, tools, commentary and web links to advance your understanding of the share market, no matter whether you are investing or trading. How to become a Toolbox member - Information about how to become a Toolbox Member. MA* - The information marked thus above is available to Share Market Toolbox Members only. Once you have your Toolbox Username and Password, you will be able to access the MA items above.